This beautiful A. Lange & Söhne Datograph 403.035 luxury watch represents the class and style of every proud owner in a unique way. 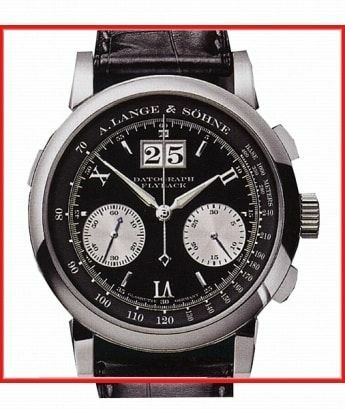 The A. Lange & Söhne Datograph 403.035 luxury watch is an authentic watch of enchanting watchmaking art. The face has Color black, Roman numerals and the lunette is 18 kt white gold, Polished. The movement is Half-oscillations A/h 18000, Mechanical manually wound movement, Lange Kaliber L951.1, 40 jewels, 36 hour powerreserve. To perfect this unmistakable luxury watch, the Aligator strap bracelet sets a perfect accentuation of the case with . The functions of this luxury watch include Chronograph, Flyback-chronograph, Big date, Hour minute. Rattapante is a leader in the online luxury watch market. From new, unused to used watches, we offer only the highest quality watches, including the A. Lange & Söhne Datograph 403.035.